There are probably many ways to catch a monkey in the wild. One of the most effective is insidious in its simplicity. The hunter gets a coconut and bores a small, cone-shaped hole in its shell, just large enough to allow a monkey to squeeze its paw inside. The hunter drains the coconut, ties it down, puts a piece of orange inside, and waits. Any monkey that comes by will smell the orange, put its paw inside the coconut to grab the juicy treat, and become trapped in the process. Capturing the monkey doesn't depend on the hunter's prowess, agility, or skill. Rather, it depends on the monkey's tenacious hold on the orange, a stubborn grip that renders it blind to a simple, lifesaving option: opening its paw. Make no mistake: the hunter doesn't trap the monkey. The monkey's abiding tendency to stick firmly to its decision, ignore evidence to the contrary, and never question its actions is the trap that holds it captive. The beliefs that we hold also hold us. Our beliefs are the best predictors of our actions in any situation (Schreiber & Moss, 2002). And, like the monkey's death grip on the orange, our beliefs are deeply rooted, often invisible, and highly resistant to change. That's why so many "tried-but-not-true" methods remain alive and well in our classrooms despite clear evidence of their ineffectiveness. Take round-robin reading, for example. This practice has been rightly characterized as one of the most ineffectual practices still used in classrooms. You know the activity: the first student in a row reads the first paragraph from a book, the second student reads the second paragraph, and so on. Round-robin reading has long been declared a "disaster" in terms of listening and meaning-making (Sloan & Latham, 1981), and the reading comprehension it promotes pales in comparison to the effects of silent reading (Hoffman & Rasinski, 2003). So why do teachers still choose it for their students, and why do the principals who observe it in classrooms continue to turn a blind eye? As our cautionary tale illustrates, it is essential for us to recognize our tendency to hold on to unexamined beliefs and practices. Each of us has our own mental map, a theory of action that directs our behavior in any situation (Argyris & Schön, 1974). What's tricky is that we actually operate under dual theories of action: an espoused theory and a theory in use. Our espoused theory is what we say we believe works in a given situation, whereas our theory in use is what actually guides our day-to-day actions (Argyris & Schön, 1974). For instance, if you ask a teacher what he believes makes assignments meaningful, he might tell you that students should be engaged in authentic tasks. Yet a visit to his classroom might reveal students copying vocabulary definitions from their textbooks. If you want to uncover what someone truly believes about any situation, look for what that person actually does in that situation. Learning involves detecting and eliminating errors (Argyris & Schön, 1978). When something isn't working, our first reaction is to look for a new strategy—a way to fix the problem—that will allow us to hold on to our original beliefs, and to ignore any research or suggestions that go against our beliefs. Argyris and Schön (1974) call this belief-preserving line of reasoning single-loop learning. Deeper levels of learning happen when we uncover what is not working and use that information to call our beliefs into question. When we question our beliefs and hold them up to critical scrutiny, we engage in the belief-altering process of double-loop learning (Argyris & Schön, 1974). Double-loop learning is how vibrant organizations change and grow (Argyris & Schön, 1978; Schön, 1983). When Nobel laureate and astrophysicist Arno Penzias, honored for his discovery of cosmic microwave background radiation, was asked what accounted for his success, he replied, "I went for the jugular question .... Change starts with the individual. So the first thing I do each morning is ask myself, 'Why do I strongly believe what I believe?'" The best way to eliminate the disparity between what we say and what we do and to invite the jugular questions is to forge a unified theory of action, shared across a school or district, that both explains and determines the actions that members take as individuals and as a community. 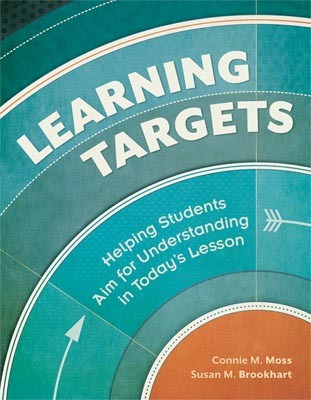 In the introduction to this book, we included a "nutshell statement" of our theory of action: The most effective teaching and the most meaningful student learning happen when teachers design the right learning target for today's lesson and use it along with their students to aim for and assess understanding. Our theory grew from our continuing research with educators focused on raising student achievement through formative assessment processes (e.g., Brookhart, Moss, & Long, 2009, 2010, 2011; Moss & Brookhart, 2009; Moss, Brookhart, & Long, 2011a, 2011b, 2011c). What we discovered and continue to refine is an understanding of the central role that learning targets play in schools. Learning targets are student-friendly descriptions—via words, pictures, actions, or some combination of the three—of what you intend students to learn or accomplish in a given lesson. When shared meaningfully, they become actual targets that students can see and direct their efforts toward. They also serve as targets for the adults in the school whose responsibility it is to plan, monitor, assess, and improve the quality of learning opportunities to raise the achievement of all students. When educators share learning targets throughout today's lesson (a subject we discuss further in Chapter 3), they reframe what counts as evidence of expert teaching and meaningful learning. And they engage in double-loop learning to question the merits of their present beliefs and practices. Learning targets drive effective instructional decisions and high-quality teaching. Teaching expertise is not simply a matter of time spent in the classroom. In truth, the novice-versus-veteran debate presents a false dichotomy. Teachers of any age and at any stage of their careers can exhibit expertise. What expert teachers have in common is that they consistently make the on-the-spot decisions that advance student achievement (Hattie, 2002). Translate success criteria into student look-fors that promote the development of assessment-capable students. Guided by learning targets, teachers partner with their students during a formative learning cycle to gather and apply strong evidence of student learning to raise achievement (Moss & Brookhart, 2009). And they make informed decisions about how and when to differentiate instruction to challenge and engage all students in important and meaningful work. Assess and adjust what they are doing to get there as they are doing it. Students who take ownership of their learning attribute what they do well to decisions that they make and control. These factors not only increase students' ability to assess and regulate their own learning but also boost their motivation to learn as they progressively see themselves as more confident and competent learners. Provide targeted feedback to individual teachers, groups of teachers, and building faculty as a whole. Guided by learning targets, principals can promote coherence between actions at the classroom level and actions at the school level. They can also better allocate resources to promote student learning and lead professional development efforts in their building. Use strong and cohesive performance data for decision making. Guided by learning targets, central-office administrators can implement effective strategies to increase student achievement across buildings with different needs and unique characteristics shaped by the students, teachers, administrators, parents, and community members who work together in each building. They can develop and manage human capital to carry out their strategy for improvement, gain district coherence, and make the strategy scalable and sustainable. Making each lesson meaningful and productive requires collective vigilance. It's not enough to "know" what works. Each day, students suffer the consequences of the mismatch between what we say is important and what actually happens during today's lesson. Learning targets are the first principle of meaningful learning and effective teaching. Today's lesson should serve a purpose in a longer learning trajectory toward some larger learning goal. It's not a learning target unless both the teacher and the students aim for it during today's lesson. Every lesson needs a performance of understanding to make the learning target for today's lesson crystal clear. Expert teachers partner with their students during a formative learning cycle to make teaching and learning visible and to maximize opportunities to feed students forward. Setting and committing to specific, appropriate, and challenging goals lead to increased student achievement and motivation to learn. Intentionally developing assessment-capable students is a crucial step toward closing the achievement gap. What students are actually doing during today's lesson is both the source of and the yardstick for school improvement efforts. Improving the teaching-learning process requires everyone in the school—teachers, students, and administrators—to have specific learning targets and look-fors. Action Point 1: Learning targets are the first principle of meaningful learning and effective teaching. The purpose of effective instruction is to promote meaningful learning that raises student achievement. The quality of both teaching and learning is enhanced when teachers and students aim for and reach specific and challenging learning targets. It's logical, really. To reach a destination, you need to know exactly where you are headed, plan the best route to get there, and monitor your progress along the way. When teachers take the time to plan lessons that focus on essential knowledge and skills and to engage students in critical reasoning processes to learn that content meaningfully, they enhance achievement for all students. As Figure 1.1 illustrates, where you are headed in the lesson makes all the difference. Defining the lesson's intended destination in terms of a specific, challenging, and appropriate learning target informs both halves of the classroom learning team—teachers and students. Teachers and their students can codirect their energies as they aim for the shared target and track their performance to make adjustments as they go. Defining the right target is the first step and the driving force in this relationship. A learning target guides everything the teacher does to set students up for success: selecting the essential content, skills, and reasoning processes to be learned; planning and delivering an effective lesson; sharing learning strategies; designing a strong performance of understanding; using effective teacher questioning; providing timely feedback to feed student learning forward; and assessing learning. The combined effect of these actions on student achievement depends on the target's clarity and degree of challenge. Figure 1.2 shows the elements of effective instruction that require and are strengthened by learning targets. The quality of these elements depends on defining a significant learning target. Taking the time to define the learning target for today's lesson brings laserlike precision to every decision I make. Once I know exactly where my students will be heading during the lesson, the learning target becomes the scalpel I use to trim and shape the lesson so that the essential content, skills, and reasoning processes take center stage. Now that I know what I want them to achieve, I can evaluate my instructional decisions as I go. Similarly, meaningful student learning happens when students know their learning target, understand what quality work looks like, and engage in thought-provoking and challenging performances of understanding. These experiences help students deepen their understanding of important content, produce evidence of their learning, and learn to self-assess. When students self-assess, they internalize standards and assume greater responsibility for their own learning (Darling-Hammond et al., 2008). Figure 1.3 (p. 16) shows the elements of meaningful student learning that require and are strengthened by learning targets. Not only are we seeing student achievement increase, but the quality of what students are achieving is also increasing. Now that our students understand where they are headed in the lesson, they are more involved in their learning, taking more pride, digging deeper, and persisting. Action Point 2: Today's lesson should serve a purpose in a longer learning trajectory toward some larger learning goal. Extend learning about a concept (e.g., "Describe how asteroids and comets fit into the solar system and the characteristics that distinguish them from one another"). What did students learn in yesterday's lesson? How well did they learn it? What can they use meaningfully? Where is their learning heading in upcoming lessons? A lesson should never ask students to do more of the same. Each lesson should have a specific purpose—a reason to live. If the adults in the school cannot define and share that purpose, then the blind are leading the blind. If neither half of the learning team—students nor teachers—knows where the learning is headed, then neither one can make informed decisions about how to get there. Action Point 3: It's not a learning target unless both the teacher and the students aim for it during today's lesson. When learning targets frame a theory of action for advancing and assessing student achievement, everyone in the classroom understands and aims for the same target. A learning target provides a clear direction for the energy of the classroom learning team and results in meaningful learning and increased student achievement. Without a learning target, the two halves of the classroom learning team expend their energy in different directions. Figure 1.4 (p. 18) shows what happens when a teacher relies on teacher-centered instructional objectives to guide planning and teaching. The teacher is the only one in the classroom who knows where the lesson is headed and expends a great deal of energy trying to get students to meet the instructional objective. Meanwhile, the students spend the bulk of their energy figuring out how to comply with what the teacher says. In contrast, learning targets help teachers and students forge a learning partnership in the classroom. As Figure 1.5 shows, energy converges on hitting the target. Both halves of the classroom learning team know exactly what they are aiming for in today's lesson—what students will come to know and understand, how well they will know it, and how they will provide evidence that they know it. Action Point 4. Every lesson needs a performance of understanding to make the learning target for today's lesson crystal clear. Ask yourself, "How do I know what students know?" Knowing what students know and drawing valid conclusions about their developing expertise should be based on strong, up-to-the-minute evidence. A performance of understanding—a learning experience that deepens student understanding and produces compelling evidence of where students are in relation to the learning target—provides evidence that both halves of the learning team can use to raise student achievement. Like Cinderella's slipper, this performance is a perfect fit for the learning target and makes the target crystal clear to everyone in the classroom. We commonly issue a three-part challenge to teachers, building principals, and central-office administrators to highlight the connection among learning targets, a performance of understanding, and data-driven decision making. First, we ask them to observe a lesson without consulting the teacher's lesson plan. They must simply observe and describe what students are actually doing during the lesson. Then they answer two questions to evaluate what they observed, based only on what the students actually did during the lesson: (1) Did students deepen their understanding of essential content and skills? and (2) What evidence did the students produce that supports your conclusions about what they knew or were able to do? For example, what if the only thing students actually did during the lesson was copy vocabulary words and definitions from a textbook, chalkboard, or website like dictionary.com? You wouldn't be able to conclude how well the students understood the vocabulary, would you? The only evidence you would have is whether or not students can accurately copy (in the case of the textbook or chalkboard) or cut and paste the results of an accurate query (in the case of the website). An effective lesson contains a performance of understanding that requires students to aim for the target, deepen their understanding, and produce evidence of what they know and can do in relation to the target. This performance of understanding could take five minutes or the entire lesson, but every lesson needs one. Remember: it isn't a learning target unless both halves of the learning team see it and aim for it. In the second part of the challenge, we ask the observer to interview several students before, during, and after the lesson, asking the following questions: "What are you learning in this lesson, and how will you know if you've learned it?" When the lesson doesn't include a performance of understanding, students commonly describe a task ("I'm copying my geography words and definitions") and cite the teacher's assessment to explain how they will know the quality of their work ("My teacher will grade my paper"). If the students aren't required to do a task that deepens their understanding during the lesson, their responses tend to be vague ("geography stuff" or "rivers and oceans"), and their gauge of how well they are doing continues to be the teacher ("We're having a test on this stuff on Friday"). For the third part of our challenge, we ask the observer to interview the teacher using the following questions: "Exactly what were students supposed to learn during this lesson, and how do you know for sure who learned it and how well they learned it, and who didn't learn it and why?" More often than not, the teacher's response begins with "hopefully": "Well, hopefully they got the idea that the circulatory system is responsible for transporting important nutrients throughout the entire body," or "Hopefully students learned that balancing a chemical equation means they are establishing the mathematical relationship between the quantity of reactants and products." When pressed to identify the evidence they used to draw their conclusions about how well the class or specific students learned the content, teachers often refer to upcoming tests ("We'll know for sure when I grade their end-of-unit test"); homework assignments ("Tomorrow we'll go over their homework and get an idea of where we stand"); or a lack of student questions during the lesson ("Believe me, if they didn't get it, they'd let me know about it"). Our three-part challenge reveals the crucial role that learning targets play for all stakeholders. Without a learning target (coupled with a performance of understanding that requires students to use and aim for the target in today's lesson), it's unlikely that teachers, students, and administrators will make informed, evidence-based decisions about student learning. Knowing exactly what students must come to understand in today's lesson and having the opportunity to gather and assess strong evidence of that understanding are essential to raising student achievement both in the short term and over the long haul. A word of caution: do not conflate the performance of understanding with the learning target. In the tale of Cinderella, the intention (the learning target) was to find Cinderella. Trying on the glass slipper (the performance of understanding) focused the search and provided the evidence. Likewise, the ultimate goal of today's lesson ought to be raising student achievement. To raise student achievement, however, we must ask ourselves, "Achievement of what?" Making decisions about achievement means that we are looking for and weighing evidence of something. The learning target identifies specifically what that "something" is in today's lesson. The learning target answers the question "Achievement of what?" The performance of understanding asks students to "try on" the target during a meaningful learning experience that produces strong evidence of student learning while students are learning. A performance of understanding enables both teachers and students to gather information and use it to improve the quality of their work. Action Point 5. Expert teachers partner with their students during a formative learning cycle to make teaching and learning visible and to maximize opportunities to feed students forward. Learning targets propel a formative learning cycle in today's lesson. The cycle (illustrated in Figure 1.6, p. 22) begins during the lesson's introduction as the teacher models and explains the learning target and continues as the teacher provides guided practice. Once students understand the concept and skills, the teacher engages them in a performance of understanding, provides formative feedback about the performance, and gives students the opportunity to improve their work. It is this "golden second chance" that makes the difference. A formative learning cycle goes hand in hand with formative assessment, which we define as "an active and intentional learning process that partners the teacher and the students to continuously and systematically gather evidence of learning with the express goal of improving student achievement" (Moss & Brookhart, 2009, p. 6). A formative learning cycle provides opportunities for continual feedback and yields evidence that addresses the three central questions of formative assessment: Where am I going? Where am I now? How can I close the gap between where I am now and where I want to go? (Hattie & Timperley, 2007; Sadler, 1989). The "I" in all three questions stands for the teacher and the students. A formative learning cycle makes teaching and learning visible in ways that raise student achievement (Black & Wiliam, 1998; Hattie, 2009). No one in the lesson is flying blind. The teacher and the students function as copilots; either of them can be the "agent" of the formative learning cycle. The focus is on how the information they gather informs the decisions they make. And even though the teacher will make most of the decisions, the cycle develops students' abilities to make informed decisions that influence their achievement as well (Wiliam, 2010). Action Point 6. Setting and committing to specific, appropriate, and challenging goals lead to increased student achievement and motivation to learn. Increases in achievement correlate directly with the degree to which students and teachers set and commit to challenging goals—both distal (long-term) and proximal (short-term). Think of distal goals as the ultimate destination—where teachers and students are headed over a unit of study. Learning targets subdivide distal goals into lesson-sized proximal goals. These proximal goals become the mile markers we use to measure how well we are doing along the way and to help students recognize that they have what it takes to finish their journey. Distal and proximal goals serve different but equally important purposes. Students benefit from the motivational pull of long-term goals ("I will be able to use the scientific method to help me solve everyday problems") to increase their interest in tackling short-term goals and to sustain their resolve as they deal with setbacks along the way ("I need to improve the accuracy of my field notes to make sure my observations reflect what is happening in my experiment"). In their turn, proximal goals "provide immediate incentives and guides for performance, whereas distal goals are far too removed in time to effectively mobilize effort or direct what one does in the here and now" (Bandura & Schunk, 1981, p. 587). If a student aims for the lofty, long-term goal of being a better reader and then sets a general proximal goal of "doing my best" during today's lesson, the process will have little effect on the "here and now" or the "ever after." Students need specific short-term goals to aim toward—for example, "Today I will look at words I do not know to see if they contain root words that can help me figure out their meaning." It is important that goals are set at the appropriate level of challenge. Achievement is an upward-spiraling process: if students do not hit the target in today's lesson, achievement stalls. And if the degree of challenge in tomorrow's lesson does not increase appropriately, achievement plateaus or derails completely. During instructional planning, expert teachers use specific learning targets to remove distracting items and irrelevant tasks from today's lesson. In doing so, they make it more likely that students will focus on and commit to reaching the goals embedded in the learning target and learn to set their own goals in the process (Locke & Latham, 2002). Interestingly, Locke and Latham (1990) found that working toward a challenging goal positively affects student achievement regardless of who sets the goal. Still, keep in mind that although teaching students to set goals is important, it is the process of feeding them forward toward an appropriately challenging goal that creates student buy-in. When teachers give feedback to students who have no commitment to reaching the learning target, the feedback packs little punch. Conversely, asking students to set goals without giving them the benefit of teacher feedback packs no learning punch at all (Locke & Latham, 1990). Feeding students forward helps them consistently succeed, recognize their success, and attribute that success to what they do—meaning that an occasional failure or setback will be less likely to dampen student optimism or resolve. Feeding forward also means that students will "set and get" an increasing number of challenging goals. Action Point 7. Intentionally developing assessment-capable students is a crucial step toward closing the achievement gap. One of the most effective steps we can take to close the achievement gap is to teach all students how to self-assess and give them plenty of feedback as they are doing so (Hattie, 2009, 2012; Moss et al., 2011c). Assessment-capable students engage in the lesson as active partners who co-construct learning with the teacher. They understand and continually use student look-fors—the success criteria for today's lesson—to recognize how well they are doing. When they discover they are not progressing, they ask effective questions. They seek feedback from a variety of reliable sources, including their teacher, their peers, and information resources like rubrics, books, and media. Then they use that feedback to figure out the next steps to take in their learning. During a formative learning cycle, student questioning is taught, valued, and expected as one of the indicators of meaningful learning (Moss & Brookhart, 2009). Assessment-capable students are resilient, have stick-to-itiveness, learn how to thrive on challenge, and develop a can-do attitude. Each day, they pursue a slightly more challenging learning target and benefit from being fed forward to meet it. They understand that meaningful learning is a deliberate pursuit of increased knowledge and skills that requires successful learning strategies. They also realize that their errors and missteps are important sources of information that they can use to learn about what is working and what is not, and to decide what they should do next. Assessment-capable students develop in classrooms led by expert—not necessarily experienced—teachers (Hattie, 2002). Expert teachers consistently make decisions that increase student achievement and motivation to learn. They intentionally help students hone their metacognitive and decision-making skills and provide appropriate degrees of challenge and support to help students master targeted concepts and learn to monitor their own progress. Action Point 8. What students are actually doing during today's lesson is both the source of and the yardstick for school improvement efforts. Our theory of action supports using what happens in today's lesson to advance and gauge school improvement efforts. After all, that's how kids live their learning—one lesson at a time. A districtwide initiative to raise student achievement should be fueled by data that accurately represent the real-world data model. And the real world of schools happens one day and one lesson at a time. Summative classroom assessments and standardized tests are macro-level data. They act as wide-angle lenses and provide the big picture of what is happening over time in a classroom, building, or district. These sources of information tell us the general achievements of a specific student or a group of students by subject, time period, grade level, or other grouping. Looking for what students are actually doing during today's lesson is like using a close-up lens. These data yield a detailed view of what happens during a particular lesson in a particular classroom to pinpoint what is working in the lesson—and what is not—for a particular student or group of students. Schools need both long-term and short-term goals. Graduating a class of self-regulated, assessment-capable, and lifelong learners doesn't just happen because we say it will. It happens when students set specific goals during today's lesson to reach their learning target, select appropriate strategies to help them get there, receive quality feedback that helps them gauge their progress against a set of student look-fors, and then use their new learning to meet the challenges in tomorrow's lesson. The long-term goal gives us something to shoot for, but what's happening in today's lesson makes or breaks our chances for raising student achievement in significant and meaningful ways. A learning target theory of action uses evidence that comes from the classroom to inform our decisions about what it takes to develop expert teachers, accomplished administrators, and schools that produce competent young adults and lifelong learners. Action Point 9. Improving the teaching-learning process requires everyone in the school—teachers, students, and administrators—to have specific learning targets and look-fors. Observing isn't the same as seeing. Our own research convinces us that educators do not describe what they see during a classroom observation; rather, they see what they can describe (Brookhart et al., 2011; Moss, 2002). For example, a principal who does not understand the characteristics of a performance of understanding can observe 1,000 lessons and never distinguish lessons that have one from lessons that do not. Our theory of action urges students, teachers, principals, and central-office administrators to look for and learn from what effective instruction and meaningful learning look like. Compare this theory of action with the more traditional use of classroom look-fors. Usually, look-fors are what adults—most often building principals—use to observe teachers and assess their instruction according to a list of "best practices." Unfortunately, no two lists agree on the specific practices they contain and the number of best practices they direct observers to look for. What's more, "best practices" tend to mean different things to different observers. Ask 20 principals what "engaged learning" looks like, and you will get 20 different descriptions. What is most troubling is that traditional lists assume that all "best practices" have the same power to raise student achievement. There are no neutral educational practices; they all affect learning for better or worse to some degree. Many so-called best practices exert minimal influence on student learning. If we want to finally close the achievement gap, we should concentrate on advancing practices that make a significant difference in student learning and achievement (see, for example, Darling-Hammond et al., 2008; Hattie, 2009). Here's the bottom line: a list of best-practice look-fors rarely adds up to a cohesive theory of action. All members of the school—students, teachers, principals, and central-office administrators—need to use look-fors. Each person should be assessing his or her success according to a cohesive set of criteria. Each person can claim success when the agreed-upon, research-based actions that they take raise student achievement during today's lesson. With a learning target theory of action, all stakeholders in the learning community know where they are and where they are headed and use strong evidence of student achievement to decide how to close the gap between the two. In Chapter 2, we examine how to design specific learning targets for today's lesson—the first principle of meaningful learning and effective instruction.